cryptonaut-in-exile: Ada Lovelace, the first computer programmer, "Enchantress of Numbers." Ada Lovelace, the first computer programmer, "Enchantress of Numbers." 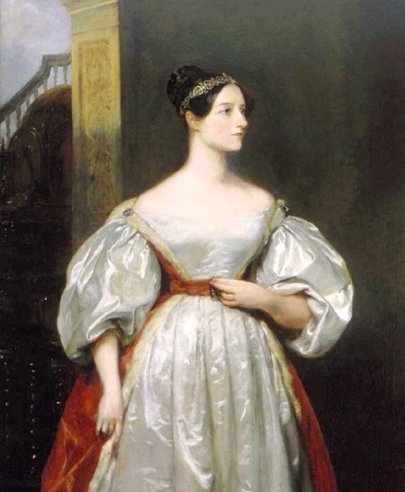 ADA LOVELACE (Augusta Ada King, Countess of Lovelace, 1815-52) was the only legitimate child of the most famous, and famously decadent, man of his age: Romantic poet George Gordon, Lord Byron. Her mother, concerned to nip any inherited madness or badness in the bud, immersed young Ada in mathematics and science, which were considered not dangerous to know. But Lovelace, Charles Babbage’s “Enchantress of Numbers,” used their power to create a technology much more disruptive than Romantic poetry had ever dreamt of being. Working with Babbage on his Difference Engine, Lovelace wrote what would have been the world’s first computer program, had Babbage ever managed to build the world’s first computer. Today is Ada Lovelace's 195th birthday. Glad you posted today. e-book:"Ada, the Enchantress of Numbers:Poetical Science"